CARACAS, Venezuela -- Days before a polarizing vote to start rewriting its constitution, Venezuela is convulsing to a rhythm of daytime strikes and nocturnal clashes. The most recent violence drove the death toll from nearly four months of unrest to 102 on Thursday. Most of the dead in anti-government protests that began in April are young men killed by gunfire. The toll also includes looters; police allegedly attacked by protesters; and civilians killed in accidents related to roadblocks set up during demonstrations. The count has been highly politicized, with the opposition and other government agencies reporting varying tolls and causes of death that focus blame on the other side. The protests began over moves by President Nicolas Maduro's government to restrict the powers of the opposition-controlled National Assembly. But the mounting deaths of demonstrators have become a separate source of outrage for the young people who march during the day and assemble nightly to fight the police and national guardsmen at improvised barricades across the country. "The ones who have fallen fighting repression motivate us to keep fighting," said Sandra Fernandez, a 21-year-old university student. The country's chief prosecutor reported Thursday on Twitter that a 16-year-old was killed at a protest in the capital overnight while a 23-year-old man was slain at a demonstration in Merida state. The four killings pushed the death toll of the political crisis above the century mark. The oil-rich South American country, which was in the second day of a two-day general strike that shuttered businesses nationwide, has also seen thousands of injuries and arrests. The bridge that connects Venezuela and Cúcuta, Colombia, has always been a busy border crossing, but the number of Venezuelans walking into Colombia only increases as the violence and instability in their country intensifies, reports CBS News correspondent Manuel Bojorquez. The luggage coming through makes the border look like an airport. Thousands of Venezuelans cross daily in search of food, medicine and work. Some return home, but Marcos Gonzales said he can't. His wife, Liliola Gonzales, and son, who recently had heart surgery, came with him. "There's no medicine," she said. "He has autism too and needs medication." 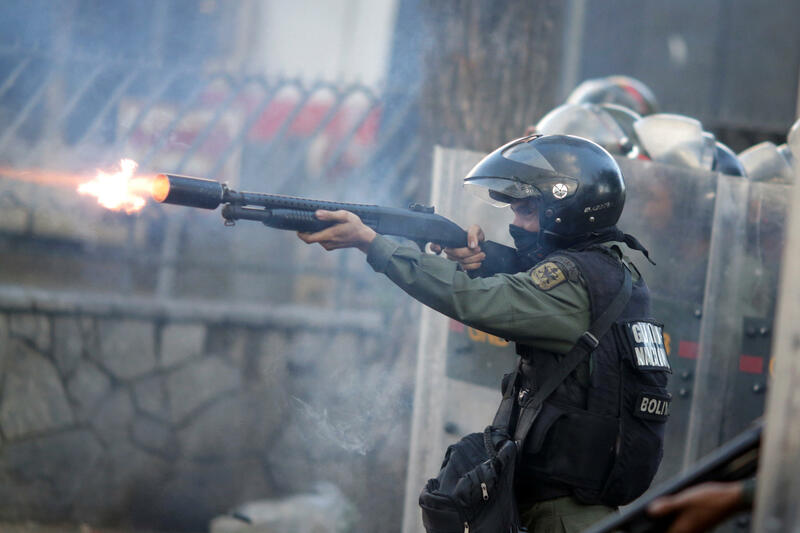 The death toll in Venezuela appears likely to keep rising in the coming days. Opposition leaders have called on supporters to convene in the capital Friday at the end of a 48-hour general strike that began Wednesday. On Sunday the government holds a vote that will start a process of rewriting the constitution by electing members of a special assembly to reshape the charter. The opposition is boycotting that vote, saying the election rules were rigged to guarantee Maduro a majority and arguing that a new constitution could replace democracy with a single-party authoritarian system. The chief prosecutor's office has released little information about the victims of the unrest, but at least 44 are believed to have been shot while participating in protests. Many of those deaths are blamed on armed motorcycle gangs of government supporters known as "colectivos" who are often seen shooting indiscriminately at protesters while police and troops stand by. "The level of impunity is extremely high, and that continues on to a situation like this," said David Smilde, a Tulane University expert on Venezuela. "If you look at the violence it would appear that this time around, most of it is coming from pro-government forces, either National Guard and police or 'colectivos' that are aligned with the government." Compared to a spate of protests that left 43 dead on both sides in 2014, Smilde said, "This time around most of it is coming from government forces, either National Guard and police or 'colectivos' that are aligned with the government." Security forces have been accused of excessive force but have used mostly non-lethal arms, a tactic that has kept protest deaths relatively low in comparison with the overall level of violence in a country with one of the world's highest homicide rates. An average of 78 people a day died violently last year in this country of 31.5 million, according the non-governmental Venezuelan Violence Observatory. According to an AP review of prosecutors' reports, the victims of the political unrest have overwhelmingly been male, with only six women killed. They are also mostly young, averaging 27 years old. The youngest was 14 and the oldest 54. At least 22 were students. A handful were police or soldiers. Sixty-nine of the deaths were from gunshots. Just 21 of the killings have resulted in an arrest or orders for apprehension issued, with nearly half those coming against security forces. Lander's mother, Zugeimar Armas, who has kept her son's room intact since his death in early June, said that regardless of whether her son was killed by the National Guard or an improvised bomb, she blames the government. "What need does a 17-year-old boy have to be in the streets?" she asked.